For the love of movies. 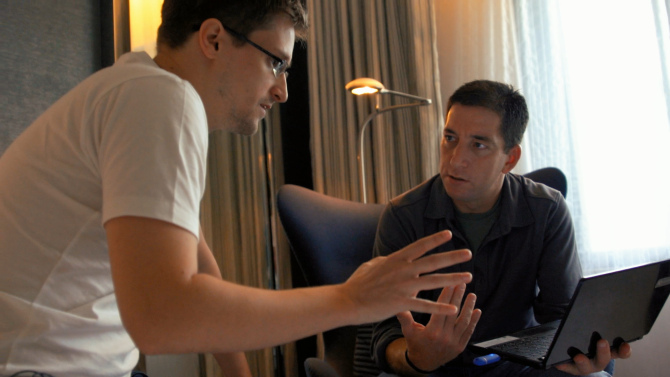 Edward Snowden (left) explains Glenn Greenwald (right) how it’s done. Who is Edward Snowden? Why even bother posing the question, you may ask, as the answer seems to be blatantly obvious: a world-famous whistleblower. The person who first appeared under the alias of Citizenfour to reveal the truth about the NSA, PRISM, and TEMPORA in 2013. We all know his name and face now, but we don’t really know the man and his motivations at all, at least not from a firsthand account. Is he a hero, as part of the internet community portrays him to be, or a villain, as most of the Western (and particularly) American officials paint him? The documentary Citizenfour by Laura Pointras chronicles Edward Snowden and the way he made his shocking revelations public. A good chunk of the film consists of the one-week interview marathon the whistleblower conducted with investigative journalist Glenn Greenwald from The Guardian and Poitras in a Hong Kong hotel room. These bits are especially interesting, for they offer an insight on Edward Snowden, the man, rather than what we usually hear and see about him in the media. The Asian sections are interwoven with footage of (mostly American) politicians and high-ranked secret service members giving statements on the state of national and global internet security. If you haven’t been paranoid thus far, watching Citizenfour is probably the very moment to become just that. By using basic examples, Edward Snowden shows the somewhat dumbfounded Glenn Greenwald how the NSA and its British equivalent GCHQ can basically find out everything about anyone they wish, even if that particular person hasn’t signed up for accounts at Facebook, Google, and all the other usual suspects. It’s both fascinating and extremely disturbing that a cell phone and cashless payments, for instance, can already be enough to give away everything about you – even if you try to stay away from the internet. What Edward Snowden (plus Glenn Greenwald and Laura Poitras as his proxies) uncovers in Citizenfour is that George Orwell’s worst nightmares have already become reality. True, it has happened a little later than the science-fiction writer expected, but ‘Big Brother’ is, in fact, watching us all. Those who are somehow able to obtain inside information about the total surveillance face serious threats, courtesy of the intelligence apparatus. Not surprisingly, Greenwald remains in Brazil, Poitras has relocated to Berlin, while, as we all know, Edward Snowden has been granted asylum in Russia. It’s perhaps neither a coincidence, then, that the movie has been released by a small distributor, whereas, in all probability, none of the major studios would touch such a delicate subject. Imagine Citizenfour opening with a Disney, Fox, Universal, or Warner logo – impossible. Aligning themselves with a controversial filmmaker such as Laura Poitras would do harm to their business, although there could be worse fates for the documentary than landing with a division of The Weinstein Company. It’s not a blockbuster, after all, despite the fact that it should be on everybody’s watch list. Apart from introducing us to the PRISM and TEMPORA shock in more detail, the focus of Citizenfour seems to be to answer the question who Edward Snowden is as a person. In the documentary, he comes across as an honorable, diligent man. Someone who wants to inspire us so that we open our eyes and wake up to save us from ourselves. Does that make him a savior, a ‘Digital Jesus’ of sorts, however? Before he uncloaked the doings of GHCQ and the NSA, he had been part of the surveillance apparatus with the equivalent of a carte blanche security clearance. Therefore his tale is more of a ‘Conversion of Saul’ story. For the U.S. authorities, the stance on Edward Snowden is clear. The man is a traitor, for he exposed critical inside information about the high-tech secret services. Edward Snowden has demonstrated that even a single man can compromise their activities, at least to some degree. While numerous voices clamor for him to receive the Peace Nobel Prize, there is essentially a reward on his head. That’s why staying somewhere in Russia might just be his safest bet for now. Wouldn’t it be pure irony, though, if Edward Snowden won the Peace Nobel Prize some time soon, only to be chased by a fellow member in current U.S. President Barack Obama? That’s the United States, the ‘Land of the Free and the Home of the Brave,’ of the 21st century. Some may argue that people pointing out injustice are pilloried, while those who are responsible for these wrongdoings are allowed to go on about their business without further consequences. As the unofficial American poet laureate Walt Whitman once wrote, ‘Do I contradict myself? Very well then, I contradict myself. I am large. I contain multitudes,’ and such are the complex times we live in. For that reason, it’s imperative to get an idea of what’s happening in the digital world of today by watching Citizenfour. If you still believe you have nothing to hide afterwards, you can continue living your life as before without much harm done. If not, the film might indeed give you an outlook of what the future might look like if nothing changes. That way or other, Citizenfour is well worth the ticket price at your local movie theater. Double Agents: Guy Ritchie Reveals The Man From U.N.C.L.E.